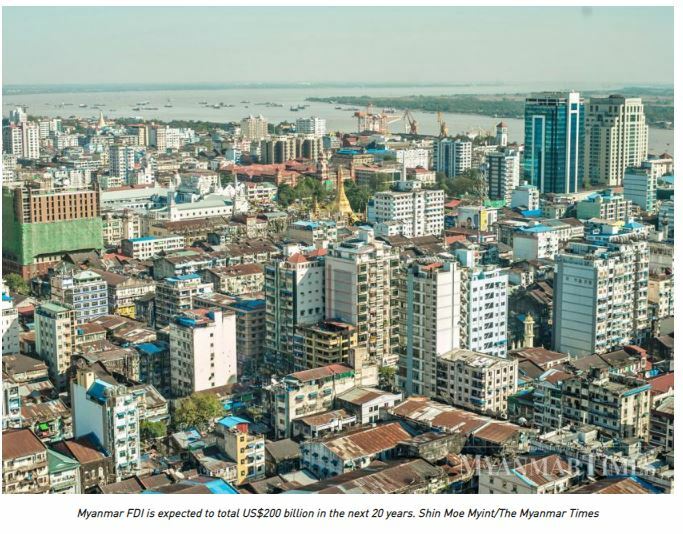 Myanmar is gunning for more foreign direct investments (FDI) from East Asia in the next 20 years under its new Myanmar Investment Promotion Plan (MIPP), U Than Aung Kyaw, deputy director general of the Directorate of Investment and Company Administration (DICA) told The Myanmar Times at a book launch in Yangon on Thursday. Besides strengthening trade ties with its ASEAN neighbours, Myanmar will also target FDI from East Asia, which includes South Korea, Japan and Greater China under its 20-year investment plan, U Than Aung Kyaw said. “Our aim is to invite East Asian countries to raise their investments in Myanmar. We will work on policies that encourage FDI from that region,” he said. Currently, the bulk of FDI in Myanmar is from China, Singapore, Thailand and the UK. The shift east comes on dwindling expectations of major investments from the west, as international pressure mounts for action to be taken to ease the crisis in Rakhine, according to U Aung Naing Oo, director general of the Myanmar Investment Commision. The oil and gas sector is expected to receive larger volumes of FDI next year, during which the government is planning to open up new gas fields for international tenders. “Since the present government took office, investment policies have not really been inclusive of the gas production industry. By next year though, we will be inviting investments into this sector,” U Than Aung Kyaw said. If it comes, FDI in the oil and gas sector could bring billions in fresh funds into the country. Based on DICA’s estimates, investments are expected to total US$5.8 billion (K9.2 trillion) per year for the next five years. In 2017, Myanmar received US$6.1 billion in FDI. Over the next 20 years, FDI is forecast to reach US$220 billion under the MIPP. The investment estimates include implementation of public projects, investments from the private sector and foreign investments. U Than Aung Kyaw also expects Myanmar to up its rank from 170 to 150 on the World Bank’s ease of doing business index at the end of the 20 years and for Myanmar to become a middle-class economy within the period. Launched on October 8 by the MIC, the MIPP, which covers the period between 2016 and 2036, outlines five strategies to actively promote investments in the local economy. These include new policies and regulations, institutional development, infrastructure development and leveraging on local business systems, industries and human resources. The MIPP replaces the FDI Promotion Plan drafted in 2014, as it is necessary to align the country’s investment policies with its latest legislation. This includes the new Investment Law, Companies Law and Special Economic Zone Law. The MIPP will integrate and support both local investments and FDI with the aim of promoting responsible investments, sustainable growth and ensuring more equality. U Than Aung Kyaw added that it is also the aim for there to be continuous development in basic economic necessities such as human resources, industrial-related businesses, infrastructure and organisations to promote investment and a transparent investment system. The MIPP will also prioritise export businesses, domestic import-substitution businesses as well as businesses involved in natural resources. To make the investment promotion process smoother, discussions related to investment laws and procedures will be held regularly and efforts will be made to enact policies which will attract FDI as well as make the investment process easier. An Investment Promotion Committee, to be be led by MIC chair U Thaung Tun and which includes members who are deputy ministers from relevant departments, will be formed. “At this stage, we’ll discuss matters such as invitations for responsible investments and making the process of applying for a permit and implementing investments easier,” said U Than Aung Kyaw. Task forces will be formed to support issues relating to the law, investment exhibitions both locally and abroad, employing skilled workers, protecting intellectual property for foreign investors and finance and banking matters. Moreover, issues such as the building of export-focused businesses, improving the local market by connecting with foreign countries and raising agricultural incomes will be addressed.